Warehouse management plays a crucial role in retail business supply chains. It has implications for every part of your business and significantly affects your customer satisfaction levels. The success of your business starts with how you manage your warehouse. 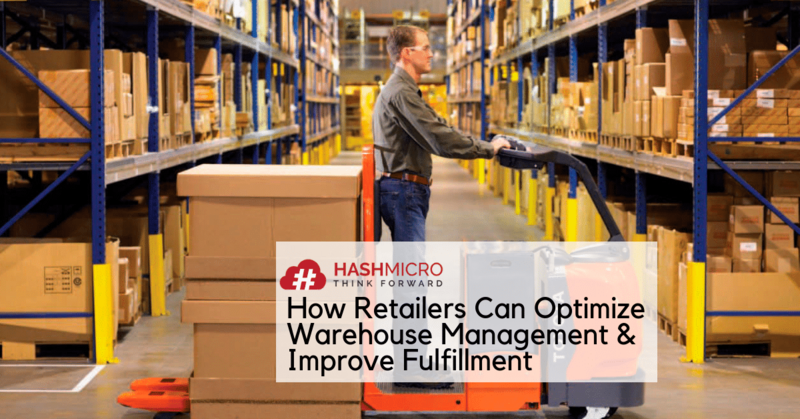 You can maximize the value you offer to your customers by optimizing your warehouse management. Here are five tips you can implement to optimize your warehouse management. To make it easier for pickers to find and pick ordered items, you should place your items based on the turnover ratio. 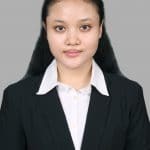 Fast-moving goods are products that sell quickly at relatively low cost, while slow-moving goods are items that have had very little customer demand over a given time period. Put your best-selling products on the front shelves, so the pickers won’t have to walk far to find them. Make sure the fast-moving items are located not far from the packing and shipping area to speed up the order fulfillment process. You will find it difficult to improve efficiency if you can’t improve your warehouse neatness and safety. When your warehouse is messy and not equipped with proper security, various risks such as loss and accident will be hard to avoid. Arrange your warehouse space and layout by optimally utilizing each area. Make sure that pallet jacks and forklifts can easily go through each aisle in your warehouse. You also need to make sure that you don’t mix multiple SKUs in the same bin location so that your staff won’t have to accidentally pick wrong items. Although one of your goals is to increase efficiency, your warehouse security must still be prioritized. Provide your employees with proper equipment to support their safety when picking and placing items. Complete your warehouse area with CCTV cameras and grant access only to those who are responsible for managing your warehouse. Order picking methods used by each retail company may not be the same. One order picking solution may suit one business and not another. It depends on the number of orders, the layout of the warehouse, the complexity, and the unique requirements of the company. Here are the best order picking methods that you can apply. Also known as pick-and-pass picking, this method requires staff to pick up items in a specified area. They must choose all SKUs located in a certain area. If an order has multiple SKUs located in different areas, they must be taken in turns from each area. For example, when a picker has taken all SKUs from first area, they can continue picking the items from the second area and so on. Then, all the items taken can be either placed directly into the packaging or shipping area. This method is used when you have multiple orders with the same SKU number. The picker must take items from several orders, with the same SKU number at the same time. Therefore, they only need to make one trip to pick up those items. This method requires staff to take several items from several orders in one trip and then put them into different containers. When doing this, they will need a push cart consisting of multiple containers for different items. With this method, the picker must take items from one order, one SKU number, at a time. The schedules for picking up items can be determined at certain times of the day, to synchronize and optimize the picking and delivery processes. Manually managing a warehouse while relying on paper records and spreadsheets is very inefficient. Imagine how much time has been wasted to keep track of the good movements and how much loss you have experienced due to inaccurate data or order fulfillment issues? Your competitors may have been automating their warehouse and inventory management processes with automated solutions. So, why haven’t you? Warehouse Management Software (WMS) makes it easier for you to monitor the entry and exit of goods, automate inventory audit procedures, speed up the picking and packing processes so as to ensure timely orders fulfillment. It also provides complete real-time data on inventory status, turnover ratio, item allocation, and etc. 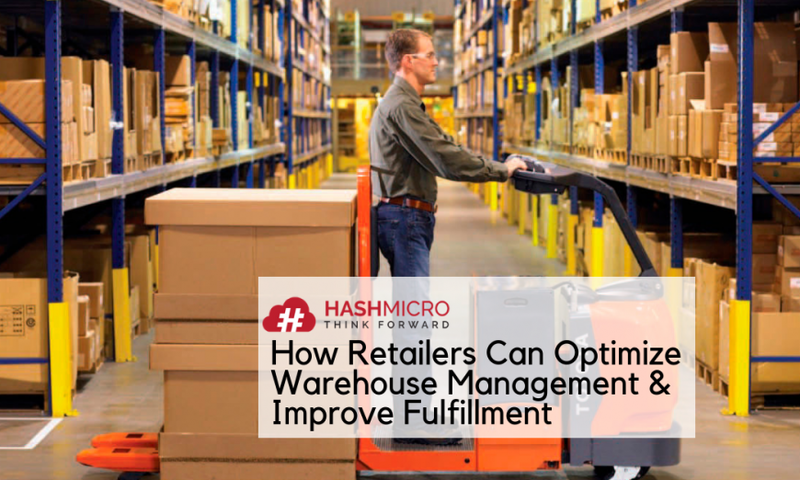 Complete and advanced WMS like HashMicro’s can be integrated with Inventory Management Software (IMS) to optimize your retail operations. This integration enables you to manage your stock levels and forecast demand for your products, thereby avoiding stock-outs and overstock as well as unnecessary purchases. Order Fill Rate: The percentage of items ordered from the amount of inventory on hand. This is also known as demand satisfaction rate. Order Picking Accuracy: The percentage of orders picked without errors both from choosing the product and the quantity. On-Time Shipment to Customer: Percentage of orders sent on the requested or specified date. Successful retail companies usually have a level of timeliness of 97% or higher. Warehouse Capacity: The physical and actual capacity of the warehouse area used for inventory storage. Once you have succeeded in measuring the results of the new processes and technologies that you are implementing, you will be able to understand how and where you can continue to improve the efficiency and productivity of your warehouse. For more information about how WMS and IMS can help optimize your warehouse management, please visit our website or discuss your requirements with us.